~ A journey to discover my American story. Growing up in Ireland, in the 70s and 80s, we learned all we needed to know about America from our TV sets. So, armed with episodes of Little House on the Prairie, Dallas and Kojak, my American education consisted of little girls getting into all sorts of adventures, rich oil barons with big cowboy hats committing adultery and drinking huge amounts of whiskey, and learning that I should stay away from New York City because of the number of violent murders taking place on, what seemed to me, an hourly basis. Apart from all that, there were just two other American institutions that I carried with me down through the years and that I promised myself I would experience if I ever made my way across the Atlantic. Firstly, and this might seem a bit strange to you all, I told myself that if ever I made it to New York (without being murdered and appearing on Kojak), the first thing I would do would be to get a hot dog from one of the street vendors. Whenever I saw those vendors with their carts on TV I always thought how cool this would be. It just seems so exotic and, well, American. You must remember that when I was growing up in the Ireland of the 1970s, we didn’t have a McDonalds. Indeed, I remember when the first pizza was seen in a Cork city restaurant; it caused all manner of debate and discussion as to what it was and how you were supposed to eat it. 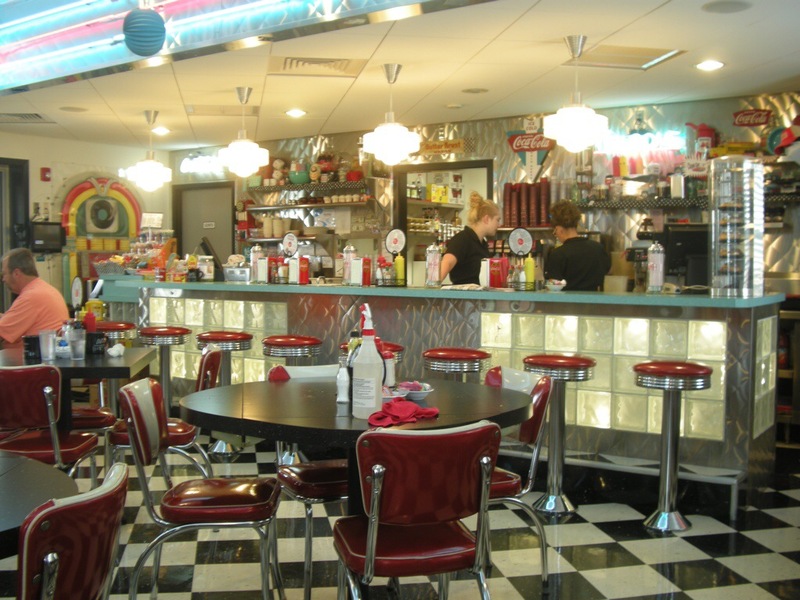 After that, my idea of glamour and total Americana was a visit to a diner. Again, we had nothing like this back home and the idea of going to a restaurant for your breakfast, your breakfast … was just completely mad and out of this world to a very impressionable kid from a rain-soaked island in the Atlantic. 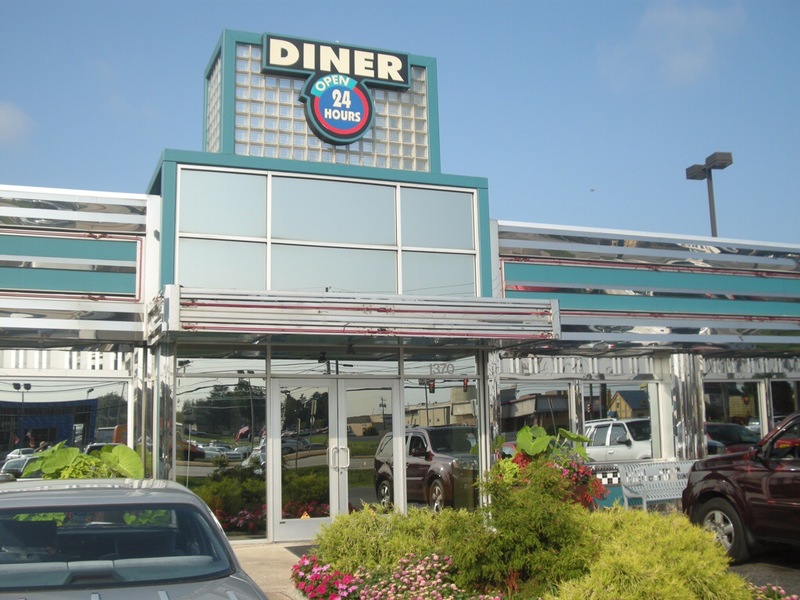 Well, this week I was able to cross one of these off my list when I paid a visit to DJs Diner in Lancaster. 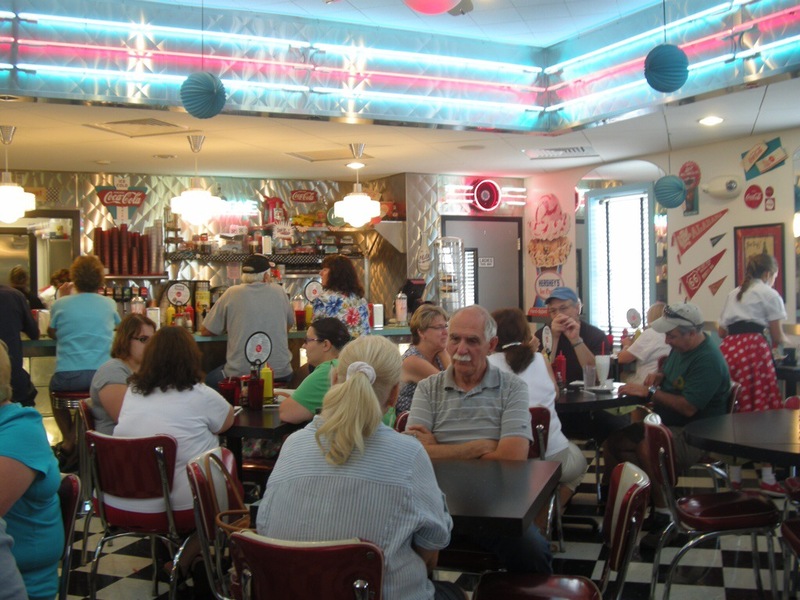 Now, DJs is no ordinary diner, far from it; DJs is stuck in some sort of time warp and when you walk through the doors, you’re suddenly transported back to the 1950s. While you stand there and your eyes adjust to the colours and the polished chrome, Buddy Holly is singing ‘That’ll be the day’ and ‘Peggy Sue’ on the jukebox in the corner. The waitresses all have big hair and bobby socks and as we take our seats, they arrive, their big skirts swooshing between the tables and the other lucky people who have discovered DJs. DJs clock stuck in the 1950s. The menu has all the favourites: burgers, melts, root beer floats and ice cream sundaes, but I thought that in a place like this they must have a good hot dog. And they did. 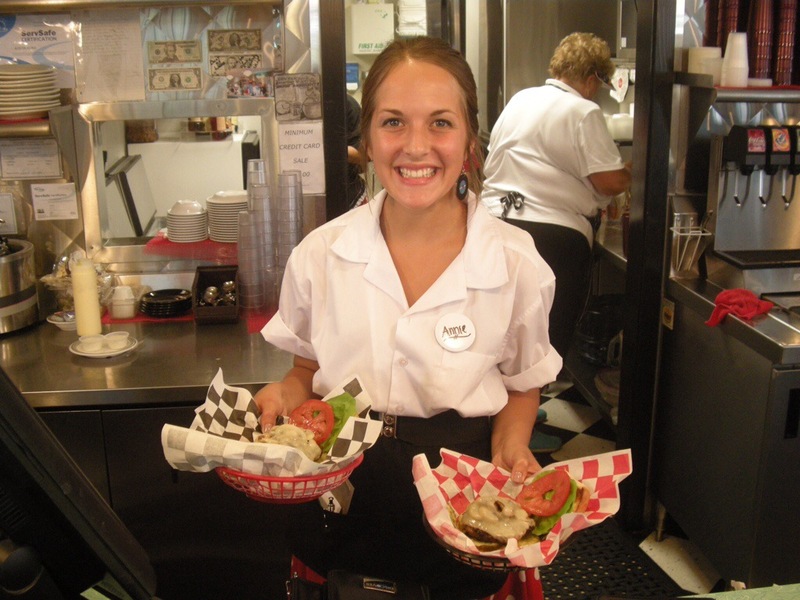 One of the waitresses. Notice the ear rings. While it’s not quite a ‘killing two birds with one stone’ kinda thing (I hope to go to New York and get my street vendor hot dog before I return home), the hot dog at DJ’s was fantastic. 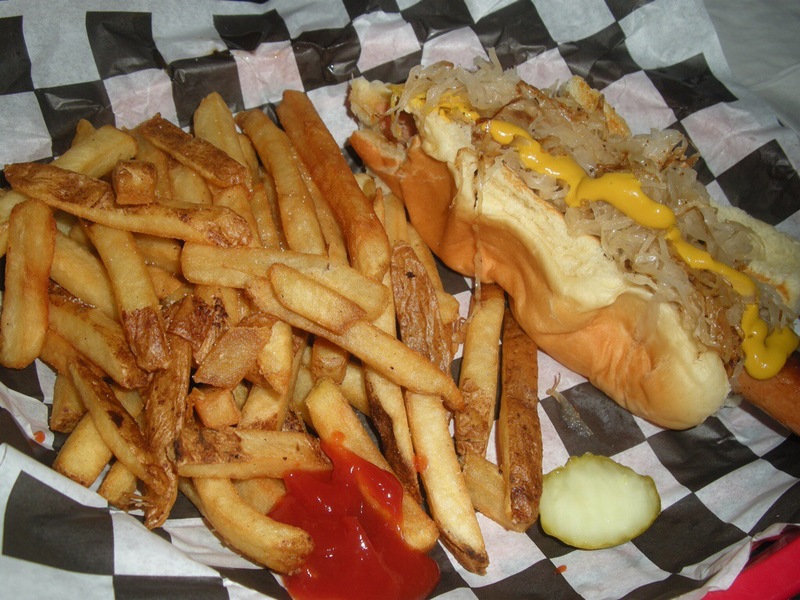 A foot-long hot dog with sauerkraut, mustard and ketchup. Oh, yeah. I also decided to go ‘full piggy’ and get a side of French fries (chips for those at home) and I will say this for the Yanks, they sure know how to make a good french fry. As we left, I decided that I was going to come back to DJs for breakfast some morning and that’s exactly what I did this morning. Now, breakfast at a diner is a totally different experience. Firstly, the waitress, still in bobby socks and big hair, brings you a mug and some coffee. Then she brings you the menu, and what a menu. I never knew there were so many ways to cook eggs. There are pancakes, large and small, plain or filled with blue berries and chocolate chips, all stacked high on the plate. Then there are biscuits (which looked like scones to me) and gravy, that’s right gravy, and lots of bacon, ham, sausage and even steak. Bacon seemed to be the meat of choice for most here at DJs this morning but it’s not bacon as we in Ireland would recognise it. This bacon here is cooked until it is as crispy as a cracker and served with eggs and pancakes. I thought, ok, bacon, eggs and pancakes, all on the one plate why not and was about to order it when I saw one person cover their bacon with maple syrup and wrap it in a pancake. In fact, everyone who had ordered this breakfast was busy putting the sugary sweet syrup all over their salty bacon. This was for me too much. I don’t have a sweet tooth and I have to say it all seems too bizarre. I know, I should have tried it and I will before I head home but I chickened out and ordered eggs, sausage and toast. I was too shy to sit at the counter. Then came the difficult part, and thank you TV for arming me with the proper response. ‘How would you like your eggs cooked,’ the 1950s waitress asked. Where my answer came from I don’t know but without thinking I said, ‘Over easy’. Now, I had no idea what I had just asked for. I guessed that the eggs would be turned, but surely the cook would turn them easily and carefully without being told? I mean, if you turn an egg hard it will break … right? Maybe that’s another way people like them? Anyway, at home the only choice you get is boiled, fried, poached or scrambled. That’s it. And another thing: the American sausage is not what I’m used to, and I’ll leave it at that. 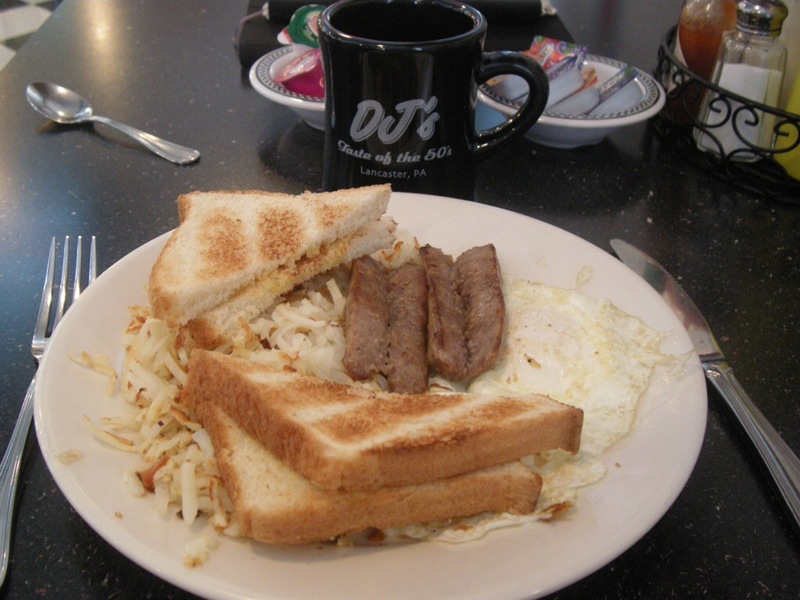 Eggs over easy, sausage, hash brown, toast and coffee. So, one down and one to go. 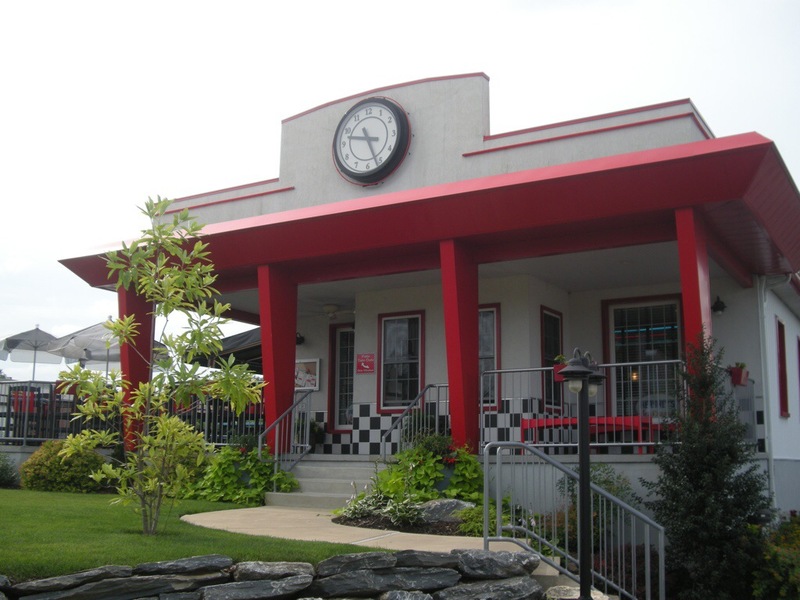 I will be back again and I hope to eat at a lot more diners as I make my way south towards Charleston. I will be loading up George W. on Sunday next, 27 July, saying farewell to Lancaster for a while and heading off towards Richmond, Virginia. Oh my! Good job!!! I’m surprised they didn’t offer you scrapple in Lancaster. It’s funny I should come home to read this email….we were just talking about the haggis we had in Scotland. LOL I think part of the fun of traveling is to try the regional foods. You’ve probably gain control over your gag reflex by now and who knows, you might find a new favorite to fix for all your buddies back home! I’m looking forward to some good BBQ down south! Thanks Brian .. Really enjoyed reading this mouthwatering post! Had very similar experiences when I first visited Chicago many years ago. I’ll check out your blog again. Regards from Thom at the immortal jukebox (plugged in and ready to play). Thanks Thom, I hope you stay tuned for scribblings from my American adventure.